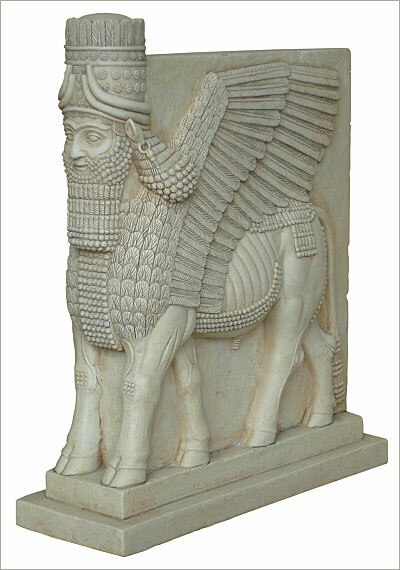 Assyrian Lamassu winged bull, Lamassu winged bull, winged bull, Assyrian. This is one of a pair of guardian figures set up in the palace of Ashurnasirpal II (883-859 BC) at the Assyrian capital of Nimrud (ancient Kalhu). These figures were known to the Assyrians as lamassu. They combined the strength of the bull, the swiftness of birds indicated by the wings, and the intelligence of the human head. They were designed to protect the palace from demonic forces, and may even have guarded the entrance to the private apartments of the king. The figure has five legs, so that when viewed from the front it stands firm, while when viewed from the side it appears to be striding forward to combat evil. The horned cap attests to their divinity, and the belt signifies their power. The Standard Inscription of Ashurnasirpal, common to many of his reliefs, is inscribed between the figure's legs. It records the King's titles, ancestry and achievements.